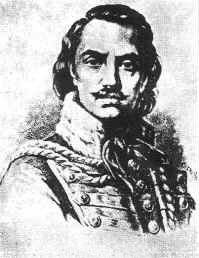 The Polish soldier Casimir Pulaski was born in Podolia in 1745 (some sources indicate 1748), and took a prominent share, under his father Count Joseph Pulaski, in the formation of the confederation of Bar and in the military operations which followed, becoming ultimately commander-in-chief of the Polish patriot forces. Driven into exile about 1772, Pulaski went to America and joined the army of George Washington in 1777. He distinguished himself at once in the battle of Brandywine, was made a brigadier-general and chief of cavalry by Congress, and fought at Germantown, and in the battles of the winter 1777-78, after which he raised a mixed corps called the Pulaski legion. At the head of this force he won further distinction in the southern theatre of war, and successfully defended Charleston in May 1779. He was mortally wounded soon afterwards at the unsuccessful attack on Savannah (Oct. 9) and died two days later onboard the American ship "Wasp." Congress voted a monument to his memory; and though this vote has never been carried into execution; the Marquis de Lafayette laid the cornerstone of a monument in Savannah in 1824, and this was completed in 1855.